The Swiss are way ahead of us in the comfort food department, thanks to a glorious assortment of flavorful, high-fat cheeses. 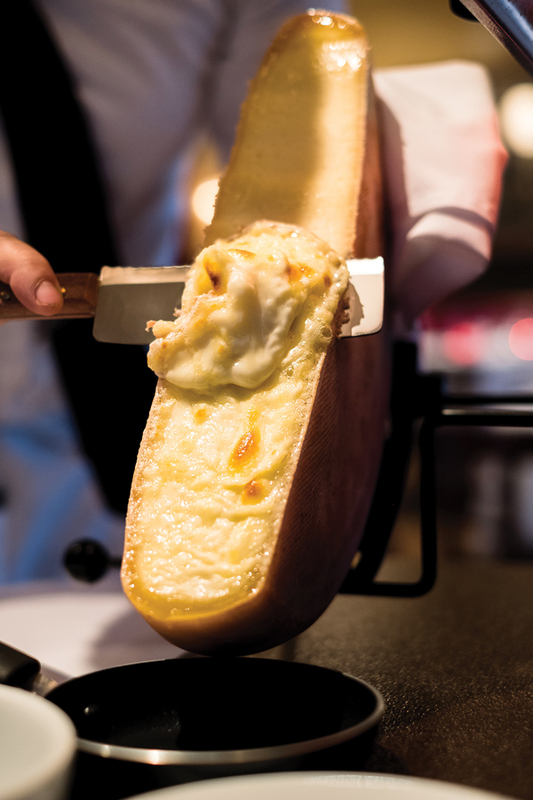 One of those—raclette, a semihard cow’s milk cheese similar to Gruyère—gave birth to a signature dish of the same name. To make traditional raclette, an open fire or grill heats the wheel until the cheese is soft, at which point it’s scraped onto a plate and garnished with fingerling potatoes, cornichons, and pickled pearl onions. The practice dates back to the Middle Ages, when cow herders traveled with wheels of cheese and roasted them by the campfire at night. One of the best places to find an authentic interpretation locally is at Pistache’s Raclette Night, hosted monthly during season. In addition to ordering the standard version as an appetizer, diners may choose between two entrees: Raclette Suisse, served over an assortment of charcuterie, and Raclette Méditerranée, with grilled vegetables as a foundation. These rustic, satisfying dishes will be available again the evening of April 17.